Mothers are more likely to suffer depression when their child is four years old than when a baby, according to a new study. Motherhood can be a tough gig. Few would dispute that, but new research hints that the old 'it gets easier' adage – routinely told to new mums – may be something of a myth. A study by Murdoch Children's Research Institute in Australia has found that a mother's mental health is more likely to be in jeopardy several years after the birth of her first child. Researchers discovered maternal depression is more likely to strike when a woman's first child reaches four years old than during the baby's first year of life. That tallies with the experience of mother of two, Maria, who had a breakdown four years after the birth of her first baby. But she wonders if these findings merely hint at the fact that maternal depression often goes undetected for years. "I had been living with depression for years without knowing it, perhaps ever since my first pregnancy," she says. "But if you had asked me four years before my breakdown whether I was depressed, I would have said no, because I had no idea that's what was wrong." New babies also elicit lots of attention – strangers stop you in the street to coo and comment – whereas considerably less warmth is extended towards mothers of tantrum-throwing toddlers. Could that waning of support also explain the later onset of maternal depression? Maria thinks so. "There's so much sympathy for new mums," she says, "but by the time your child is four, people expect you to have parenthood all figured out." Fiona Kennedy, author of the blog Sunny Spells and Scattered Showers, agrees. She is mum to Donnchadh (6) and Muireann (3) and was diagnosed with depression shortly after the birth of her first child, and later with borderline personality disorder. "Mothers also have a habit of saying everything is fine, so it's actually a relief whenever someone admits to finding things tough," she says. For Maria and Fiona, depression worsened after the birth of their second babies. "My second child was 18 months old the first time I was admitted to hospital for depression," Fiona says. "I wasn't coping at all on any level, but I quickly decided that I didn't need to be in hospital, so I persuaded them to let me home. But nine months later I had a fairly epic breakdown and ended up in Galway's psychiatric unit for five weeks with severe depression." In Maria's case, a second pregnancy unleashed a maelstrom of anxiety. "Halfway through my first pregnancy we learned that my husband was going to be posted to Iraq and then we discovered that our baby was unwell, and when she was a few weeks old her kidney was removed," she explains. "The following eight months were pure torture. My husband was in a war zone and I was home alone with no family nearby, trying to figure out life with a newborn who'd just had a major organ removed. I developed an eating disorder as a result of the stress." Maria got through that experience and when her daughter was four years old, the couple decided to try for another baby. "But it came as an incredible shock when I fell pregnant within two weeks," she says. "I vomited all day because, after the horrendous time we'd had with our first baby, I suddenly felt overwhelmed with terrible anxiety about what might go wrong." The birth of Maria's second baby was traumatic. She fractured her hip during the delivery, and her son had to stay in hospital for several weeks. But even in hospital Maria felt there was no avenue for addressing her own mental health. "I would sit the baby in front of the TV in the morning and stand in the kitchen for hours just staring into space, wondering how to cope with putting the laundry on or getting myself dressed." "I couldn't walk and yet I couldn't even get a paracetamol in hospital because I wasn't the patient," she recalls. "Any mother would lay herself down to put her baby's needs first, but I felt I had been forgotten about. The pain and suffering I'd been through just didn't seem to be valid." Maria also feels that a lack of continuity of care during pregnancy plays a part in maternal depression going unchecked. "I piled on weight during my second pregnancy as my eating spiralled out of all control," she explains. "But no one picked up on my eating disorder – I saw seven or eight different midwives throughout my pregnancy so no one had the chance to get to know me." Eventually, Maria reached an almost catatonic state. "I would sit the baby in front of the TV in the morning and stand in the kitchen for hours just staring into space, wondering how to cope with putting the laundry on or getting myself dressed." But it still didn't occur to Maria that she might be suffering from depression. "Other mums were taking their babies to various activities, whereas I desperately didn't want to leave the house. I felt lazy, stupid and fat in comparison; a monumental failure." Fiona also recalls comparing herself unfavourably to others when in the grip of depression. "I looked at other people and thought 'They're managing fine, why can't I?'" she says. And even when depression is diagnosed, it can be a struggle to accept the label. "I was in denial," admits Maria. Having faced that she needed help with her eating disorder, she sought treatment from a nutritionist and food specialist, who suggested she might be suffering from postnatal depression, which had gone unacknowledged since the birth of her first child. "I couldn't deny the food issue but depression didn't feel like 'me'," she says. "Secretly, I thought 'I'm stronger than that'." But shortly before her 40th birthday Maria had a breakdown, which began with overwhelming feelings of panic about not having achieved enough in her life. "I just lost it. I couldn't keep myself together. I was broken emotionally and for two weeks I couldn't stop crying. I knew something was really wrong but I didn't know what to do about it." Maria and Fiona are both being treated for depression now, but they agree that much more could be done to monitor maternal mental health, starting in pregnancy. "It was noted in my maternity file that I had suffered from postnatal depression after the birth of my first baby, but second time round I was discharged from hospital within hours of giving birth with no mental health monitoring," Fiona says. "I knew I could go to my GP or counsellor if there was a problem – but I would have to seek that help out, which you're not necessarily able to do when depressed." Fiona would also like to see maternal mental wellbeing addressed as part of antenatal care, and says fathers should be included. "Antenatal classes prepare you for what labour will be like and how to change a nappy but the possibility of your mental health being affected by new motherhood is never flagged." Could the pressures placed on modern mothers also play a part in maternal depression that develops later? Fiona thinks so. "Like many parents, we faced financial pressure which forced me to work full time when the children were babies, even though ideally I didn't want to do that. "So exhaustion combined with guilt and the endless juggling of childcare – it all takes its toll," she says. "No wonder maternal depression emerges for some mothers further down the line – that's when the reality dawns that things aren't actually getting any easier." According to Nurture (www.nurturepnd.org), which was set up in 2011 to offer affordable counselling and support for women dealing with pregnancy and childbirth-related mental health illnesses throughout Ireland, a key factor of maternal depression is that a woman's normal coping mechanisms are greatly reduced. 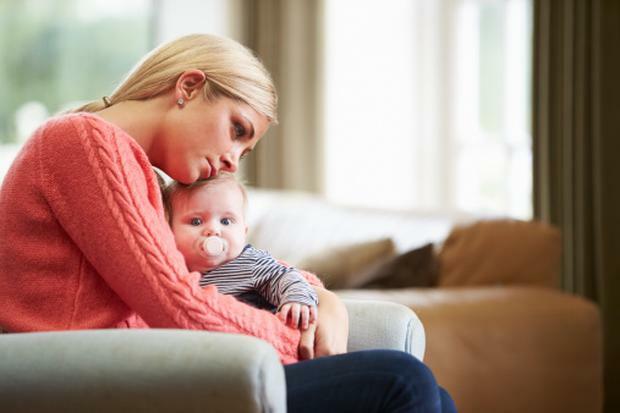 Irene Lowry, CEO of Nurture, says maternal mental health is "highly stigmatised" and that many women experience strong feelings of "shame, embarrass- ment and guilt" as well as a fear of the consequences of admitting how they feel. "But it's really important for women to know that with timely profess- ional interven- tion, like counselling from Nurture, a woman can feel well again, and family life can be restored." * Tearful/crying all the time. * Exhaustion – often aggravated by sleep deprivation. * A high level of anxiety, some-times including panic attacks. * Loss of libido, which can put pressure on a relationship. * Withdrawing from loved ones, and / or loss of interest in things you used to enjoy. * A sense of being disconnected from or not bonded to your baby.